Hajime Isayama's manga series Attack on Titan has found widespread acclaim and popularity since its debut in 2009, spawning a light novel prequel series, a TV anime adaptation and several video games. The story is set in a world where humanity came close to being wiped out altogether by a race of giants called Titans, who spawn apparently from nowhere and wander the lands eating every human that they come across. The Titans' motivations are unclear, and at first it seems impossible to either kill or communicate with them. What's left of humanity cowers in pockets of civilization hidden behind massive walls, and the main plot focuses on a young man called Eren who joins the Survey Corps, a military division dedicated to killing Titans, after witnessing the death of his mother during a Titan Attack on his village. 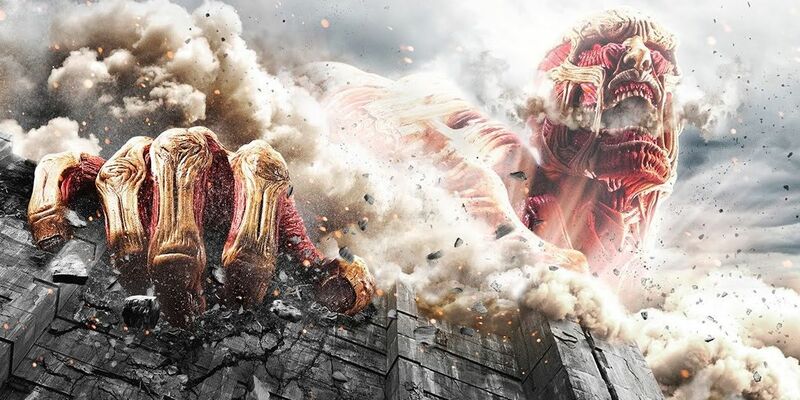 Attack on Titan has now been adapted into a live-action feature film, directed by Shinji Higuchi (The Floating Castle). Attack on Titan features an all-Japanese cast and will only receive a limited theatrical release in North America, courtesy of FUNimation Entertainment, so the marketing materials so far have all been in Japanese. For those who had difficulty following the events of the previous trailer, we can now offer the first Attack on Titan trailer with English subtitles, which introduces the premise and the main cast of characters. The visual effects in this trailer reflect the movie's modest budget, but nonetheless the Titans look very creepy, with their blank eyes and massive mouths (all the better to eat you with). As the trailer explains, the Titans can only be killed by attacking a weak spot on the back of their neck, which the Survey Corps can reach using a grappling system calling Omni-directional Mobility Gear. Attack on Titan stars Haruma Miura as Eren, Kiko Mizuhara as his foster sister Mikasa, Kanata Hongô as Eren's best friend Armin, Nanami Sakuraba as expert archer Sasha and Satomi Ishihara as squad leader Hange. The screenplay was co-written by Yûsuke Watanabe (Monsterz) and newcomer Tomohiro Machiyama. The world premiere of Attack on Titan took place this week at the Egyptian Theatre in Los Angeles, and a review from Anime News Network praises the film heavily while also warning that its tone is very different from the source material - more of a horror movie than an epic fantasy. While existing Attack on Titans fans are sure to be interested in checking this out, it looks like it could also serve as a good entry point for audiences who are unfamiliar with the manga or anime. Attack on Titan will release in Japanese theaters on August 1, 2015, followed by Attack on Titan: End of the World on September 19. A U.S. release date has not yet been announced, but FUNimation CEO Gen Fukunaga has said that it will arrive in U.S. theaters later this fall.